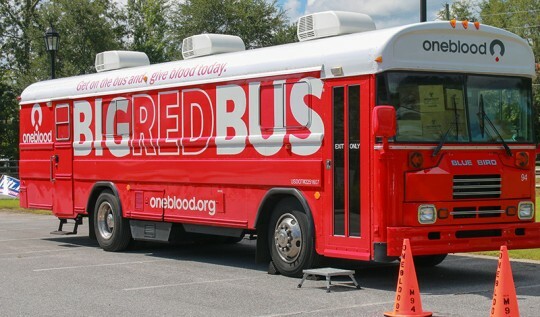 Blood drives were held Saturday at the libraries in Molino and Century, and there several additional opportunities to give this month in the North Escambia area. Century Correctional Institute Monday, September 10 from noon until 5 p.m.
University of West Florida Tuesday, September 17 from 11 a.m. until 4 p.m.
Tate High School on Wednesday, September 18 from 9 a.m. until 2:30 p.m.
Northview High School on Wednesday, September 19 from 8 a.m. until 2 p.m.
OneBlood welcomes blood donations from donors 16 years old and older. 16 year-old donors, however, must present a signed permission form from their parent or a guardian before the donation. Pictured: The OneBlood Big Red Bus Saturday at the Molino Branch Library. NorthEscambia.com photo, click to enlarge.